One of my goals in life is to wake up surprised and happy everyday, I want to look forward to getting out of bed. 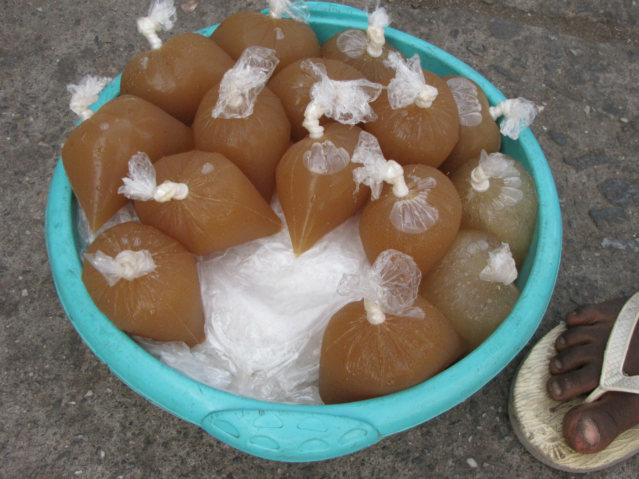 I love this frozen ginger drink, it cost 50 CFA, which is 10 cents US, it is made from raw ginger and is sold in many places in West Africa. Normally, I need to be lucky to buy this drink, when I see a girl walking by, I must purchase, I never know when I will see it again. This may be the perfect drink for me: I was surprised, I now have a steady ginger supply, I discovered a woman near my Hotel sell the drink, and she has never ran out of this wonderful taste sensation. 1. Low in calories, at least I believe it is, I am told she adds sugar, one day I hope to watch her making the drink so I can learn clearly the recipe and procedure. 2. Tart, maybe sour, it makes a sharp rush to the taste buds, this keeps me from devouring ravenously, and it is something you ingest slowly. 3. Frozen, like a Popsicle, there is joy in eating frozen ice, I am not sure why. 4. Liquid, it is hot here, I need to drink liquids and these bags hold just enough to quench my thirst, but not enough to make me break out in a shirt drenching sweat. 5. Cold, because it is cold, I feel cooler after eating, it is frozen; truly, this is a combination of eating and drinking. "What are you doing in there, that you need to close the door?" I key in on the word "need," I separate my life into wants and needs, she got me, there is no need to close the door, and it is just my custom. Now, it is always a surprise to watch a girl stand at the toilet and urinate, and the West African women can stand like a man, well, not exactly the same as a man, I hope you get the idea. The country of Cote d’Ivoire had an election a couple of months ago, the standing President Gbagbo lost in the eyes of world, and Alassane won. Gbagbo refused to step down, and the country now has two Presidents. In my opinion, it has two dictators, nobody in Cote d’Ivoire gives a hoot about the constitution, fair play, justice, all the those other words are not understood here. Well, there are two dictators here in Cote d’Ivoire, please get a life…. I was watching Television here in French, most of the time it is soap operas, or news from France, complete with Frenchie commercials, it is amazing how many English words they use for emphasis. There is a Gbagbo news channel, and there is an Alassane news channel. Truly, this is a kick to watch obvious propaganda that crosses all lines of my normal expectations. There is information, news, photos of that you would never expect to see on a USA news station. Dead bodies, people saying they are going to have a revolution, obvious treasonable statements, it is a dark comedy. It is a stalemate, both President are able to have their own propaganda news channel, nither is capable of stopping the other side, truly. Verizon Wireless has been providing various Smart Phones for my review free for the last couple of years, and I wrote this Blog post about my present trip to West Africa. Oops, what am I supposed to do, I am still here? "I need to deactivate the line. I’ve asked for a 24-hour notice for you so we don’t leave you in a lurch. The device will be shut off at 5 p.m. EST on 2/23." Ok, Ok, Ok, I am sure many readers are smiling right now; it is difficult to write, talk, or explain anything about a Verizon without someone telling me a war story of what Verizon did. Hmm, that is funny, a war story, yes I am involved in a real war, I am in a country at war, truly an interesting time to have my service cut. "Should I take the photo, or not?" "Should I be aggressive with this person, or let it pass?" "Should I attack back, or walk the other way?" "Hey, white man --- we say Hello"
I started to take my camera out, but decided not to, sometimes I am tired. I want to photograph unbounded joy; this is the type of photos that makes it all worth the time. Even though this is just simple joy, simple love, simple real life, I am tired, I know there are inherent and stupid problems when I take photos of children with no clothes. What is natural is considered bad, and what is unnatural is considered good, the world is truly confused. I always assumed that one day Verizon would shut me off, and I assumed at this time, I would purchase the service with my own money. I am ready, willing and able to pay the 69 U.S. Dollars per month for the unlimited Verizon Global Data Plan. Surprise, or no surprise, I am baffled, the company has made me into a liar, what I thought I was recommending is not what they provide, and a person could have unfathomably high bills by accident. I will only write or recommend a product or service that I would be willing to buy with my own money. This is a sad day for me, I am truly sorry I ever took this smart phone; I truly thought the Global E-mail or Data plan was good to recommend. They are shutting off the line because of extraordinarily high bills they need to pay. This is NOT French, it is the Nzema language and it sounds like Boh Frere to me. or Bohn Frayre, but there is no way to spell a Nzema word for White Man correct, anything goes.